After months of great expectations, on July 14 in Hà Nội and HCM City, investors in the North and South were thrilled to witness the official launch of the shophouse products of Sun Premier Village Primavera project, conceived and nourished by Sun Group in southern Phú Quốc. At the event, many investors were quick to purchase, all jockeying to get their hands on the hottest property product in the market at present. 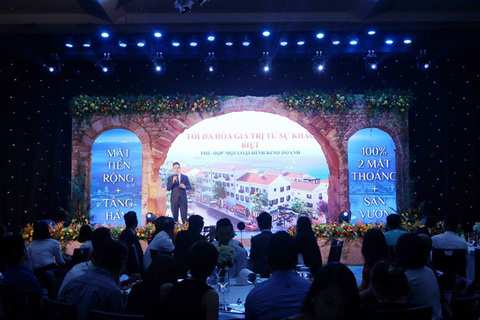 Because the real estate product was attracting the greatest interest in the Phú Quốc real estate market, it’s easy to understand why the launch event for the Sun Premier Village Primavera was so hot. The spacious rooms of Melia Hà Nội five star hotel and Gem Centre HCM City were full of people. Many investors have been amazed and fascinated with the iconic shopfront visual area of the Sun Premier Village Primavera, which is exquisitely designed at the lobby of the hotel, leading the viewer into a lively 3D environment. Looking at this picture for a long time, Hoàng Hải, an investor in Long Biên District, Hà Nội, said: "Looking at the picture, I see the Amalfi architecture, the Mediterranean right in front of you. I have been to Amalfi—it is a very beautiful place and the scenery is beautiful. The combination of natural beauty and architecture makes everyone feel overwhelmed. I expect Sun Group will create an Amalfi in South Phú Quốc with the Sun Premier Village Primavera project." Hải also revealed that he has chosen two adjacent shophouses located very close to the Hòn Thơm cable car station for a business lease. Among hundreds of investors at the launching ceremony of the project in HCM City, there were many people from provinces and cities such as Cần Thơ and Vũng Tàu. As one of the first people to come to this event, Minh Lý from Cần Thơ City said: "My husband and I have retired, therefore, we want to move to Phú Quốc for both business and trade. After searching for many projects from the beginning of the year, we feel satisfied with this project, because we love the design of the Mediterranean style. The area is diverse so it is easy to choose, we have locked down a shophouse already and now are waiting for the day to move to Phú Quốc. " The project attracted the attention of investors because of a cornucopia of outstanding advantages in the real estate market. Sun Premier Village Primavera is located right at the Hòn Thơm cable car station, which is home to thousands of passengers enjoying the longest cable car experience in the world and the Sun World Hòn Thơm Nature Park. This position is said to be "very worth the money". Moreover, this is a multi-functional shophouse with many kinds of areas, suitable for various business lines. The design of the glazed ridge along the mountainside and the title of beachfront paintings of each shophouse conquered any investor, no matter how tight-fisted. 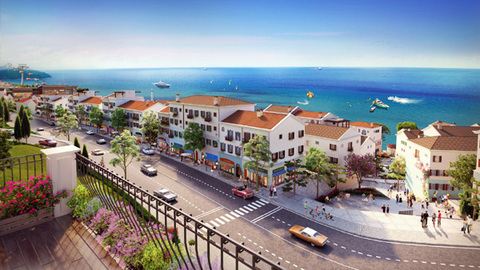 With Sun’s Premier Village Village Primavera, the Sun Group once again thrives on the market as it brings to Southern Phú Quốc a world class, unique and Amalfi-style shophouse design. A colorful and busy harbor and vibrant nights on the ocean shore will soon formed in this place. It will not only be a new destination, satisfying the needs of spending, shopping architecture-enjoying and scenery-gazing of visitors, but also bring wealth and prosperity to the shophouse owners. At the event, the investor discounted VNĐ200 million (US$8,583) directly from the shophouse price for customers who booked successfully at the launching event. Taking this golden opportunity, many modern investors registered to own the Mediterranean shophouse "within a minute." After nearly two hours of events in both Hà Nội and HCM City, nearly 70 per cent of the shophouse products had owners. According to Sun Premier Village Primavera distribution agents, the product has attracted more than 90 per cent of shophouse demand in the Phú Quốc market. With the strong growth momentum, investors have seen the prospect of a shophouse on the Emerald Island to have long-term property ownership, flexibility and stable benefits. However, the number of projects with shophouses can be counted on the fingers and the number of townhouses on a project is only under 100 units. About six months ago, when the Sun Group launched its Piperina shophouse in the Sun Premier Village Kem Beach Resort, investors also lost their sleep. Nguyễn Liên Dung, Chairman of Titan Real Estate Joint Stock Company, one of the official distributors of the project information, and Piperina shophouse owner now, has in hand profits of up to 200 per cent only after half a year, although they have paid only about 30 per cent of the value of the house. "As experts estimate, the land fund that can exploit tourism and holidays in Phú Quốc only occupies about 15 per cent of the Emerald island. So we believe it will be very difficult to have a better place to develop a shophouse than the Sun Premier Village Primavera, so the potential for price increases is obvious," Dung said. 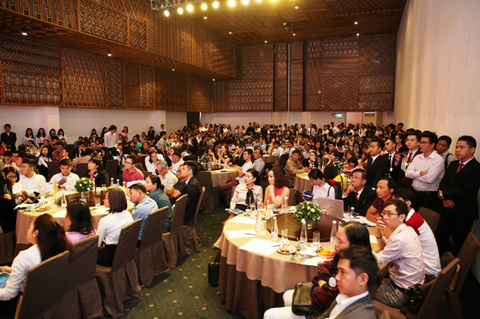 Investors also expressed their belief in the South Phú Quốc market potential with the multi-billion dollar tourism, resort and entertainment ecosystem such as JW Marriott Phú Quốc Emerald Bay, Premier Village Phu Quoc Resort and the upcoming Sun Premier Village Kem Beach Resort and Sun Premier Village The Eden Bay. When Sun Premier Village Primavera completed, this place will be the focus of the super-billion project, bringing the crowds and prosperity to Southern Phú Quốc Island, accelerating South Phú Quốc’s journey to become the economic and tourism capital of the Emerald Island.